Lard has earned a bad reputation in American culture. It’s unfortunate, because pork fat has been used as a traditional cooking ingredient for many generations. All cultures in history have used the whole animal, and prized the organs and fat just as much as the meat. 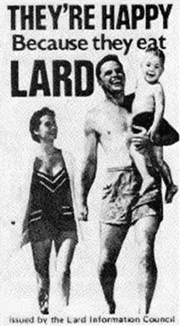 And not too long ago, lard was even a staple in the American diet. It wasn’t until the early 20th century that lard (and butter) came under attack, and what soon took its place was a newfangled industrial cooking oil: hydrogenated “vegetable oil”, invented by Procter and Gamble. Their business of cottonseed oil factories making soap and candles was dwindling due to the advent of lightbulbs. In 1907, a German chemist showed them how to hydrogenate (bombard it with hydrogen atoms) the oil and make a lard-like almost-food product, and Crisco (crystallized cottonseed oil) was born. Cottonseeds are high in polyunsaturated fat, and the hydrogenation process creates a boatload of trans-fats, which as you might have heard, are not good for your arteries. It’s no wonder fat from pigs is preferred by pie bakers over “vegetable” shortening; lard is natural. You can render it easily and minimally in a pot in your home kitchen - it does not need to be refined and processed beyond recognition. It has saturated fat and plenty of monounsaturated fat (which is what nutritionists love about olive oil). Plus, animal fats are low in polyunsaturated fat, which means they won't go rancid easily and they're great for cooking. Look for animal fat from pastured animals who get plenty of sunlight to get even more Vitamin D.
Nowadays, just about the only lard you can find at American grocery stores is from unnaturally-raised pigs, and it’s usually hydrogenated (read: full of trans fats) and heavily salted to keep it shelf-stable longer. Skip it. Your best bet is to get real pig fat from pastured pigs at your local farmer’s market or butcher. Or, you can make it yourself; luckily, it’s super easy. If you don’t eat pork, this technique can also be done with fat from beef, duck, bear - or any other fat from wild or naturally-raised animals. Cut pork fat pieces into 1-inch cubes. Simmer fat in a pot over low heat for several hours until the fat is completely rendered. For an easy and tasty dish, try tossing the fat with vegetables before oven-roasting them (like these baked sweet potato fries). Yum. And if you want it now and can’t wait, try shopping for non-hydrogenated lard, or try this one from pastured pigs by Fatworks. Be a part of the real food movement.